This bow might be my favourite accessory I own. It's by Armani Collezioni and I picked it up at a sample sale for just £5. I love it, I feel like a smart clown and the material is seriously lush. I'll let you touch it if you like :) I'm wearing my outfit with a black feather shawl from Primark for a fancy dress evening which has turned out very useful, I wore it almost everyday last winter with my thick, woolen, black cloak. The dress is Zara - it has a lace high neckline and a bubble bottom finish. It's not my favourite dress but the high neck makes it go well with the bow tie without having to wear a shirt - too hot for that today! Both necklaces are presents from two very lovely people and the shoes are some old ones I used to wear for work from River Island. 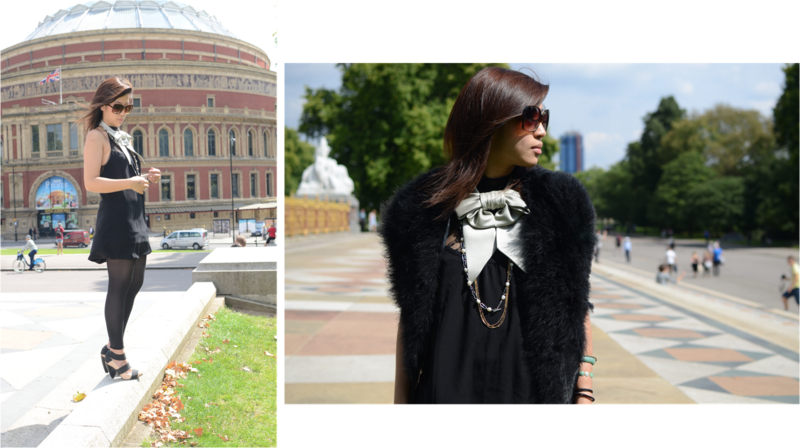 Editing my pictures today really made me feel so lucky to live in London - that's the Royal Albert Hall in the background! love the bow...what a bargain!